Last time we were in Miami, Mike and I had a couple fun nights at The Broken Shaker (@TheBrokenShaker), one of the best bars in town. This cocktail bar is located in the trendy Freehand Hostel (@freehandmiami) in Miami Beach, which also houses 27 (@27Restaurant), a restaurant located in the courtyard of the hostel. The restaurant, which opened at the end of 2014, is open every day from 6:30pm till 2:00am. 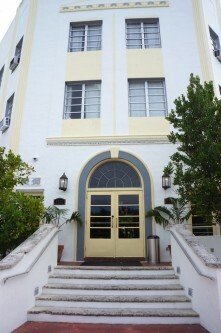 We dropped by for brunch which is offered on Sundays from 11:00am to 4:00pm. 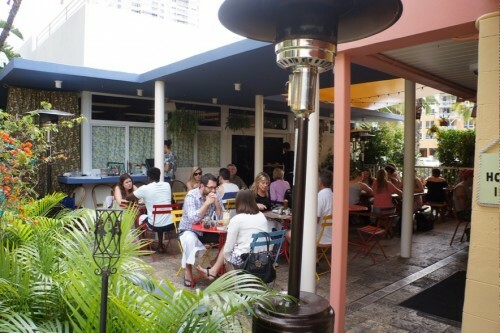 The restaurant itself is located in a little two-story house with a shaded patio outside. You enter through the main hostel entrance – just head towards the pool/courtyard where you’ll see a small building at the back. The interior of the restaurant has a very hippie and kitschy feel to it and everyone who worked here just seemed to be very laid back. And hipster – very unlike Miami! It felt a little dark inside which wouldn’t be ideal for brunch but I bet the atmosphere inside is a lot better in the evening. Since we had a reservation, we were able to get a great seat outside on the patio. 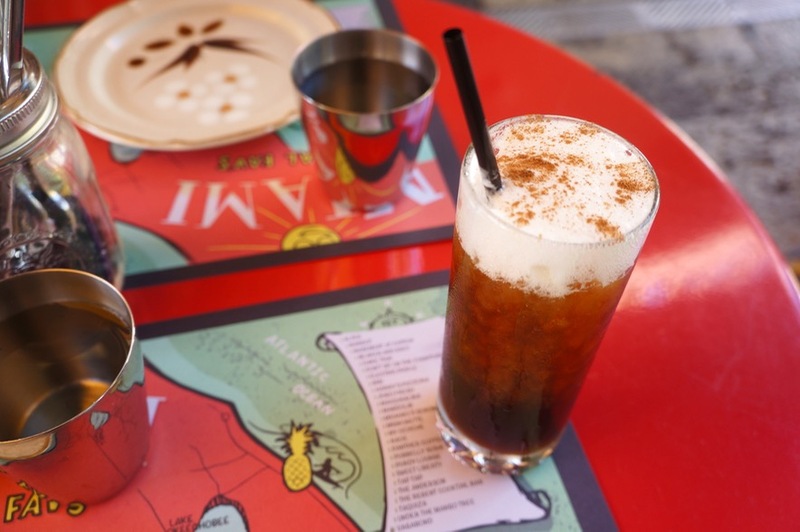 According to their website, “The menu pays homage to the diversity of Miami and its melting pot of flavors and cultures.” The menu certainly reflects this – during dinner you’ll find an eclectic mix of dishes like griot & pickliz, tagliatelle, shawarma and kimchi fried rice. Compared to the dinner menu, the brunch menu is a lot smaller and isn’t quite as eclectic. Regardless, we still had a tough time narrowing down what to order. Everything sounded delicious! After ordering, our server informed us that the dishes would arrive as they’re ready. This works a lot better if you’re sharing everything as opposed to ordering your own dish. 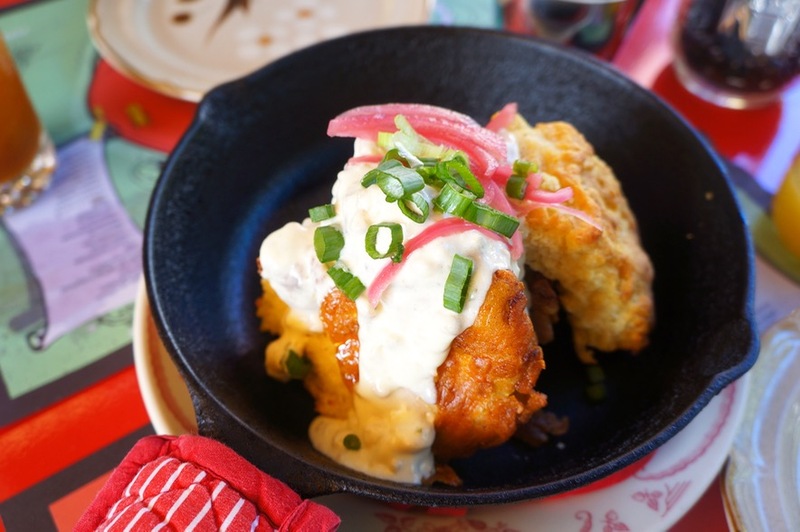 The first dish to arrive was the Fried Chicken and Buttermilk Biscuit – sausage gravy, pickled red onions ($17). The meat was wonderfully moist and was seasoned perfectly. It had a nice crisp skin that was topped with their delicious sausage gravy and pickled onions. All the components of this dish were incredibly tasty, including the fluffy biscuit. My only complaint was that the dish arrived lukewarm. I only snapped a few quick photos before digging into it and it wasn’t hot at all. Both the fried chicken and gravy tasted as though it had been sitting out for a little bit. It was still a tasty dish but I bet it would’ve been even better if it arrived hot. 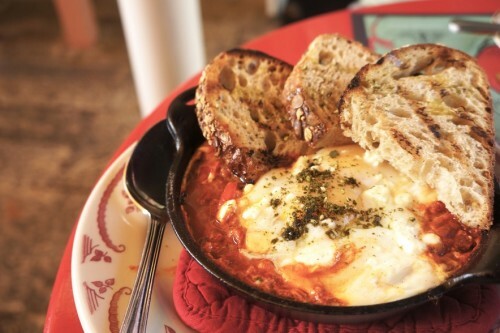 Up next was Elad’s Shakshuka – stewed tomato, two eggs, ZTB bread ($14). In contrast to the fried chicken, the shakshuka arrived steaming hot. We poked our forks into the poached eggs and the yolks burst into the delicious stewed tomatoes. The dish was accompanied by a couple slices of Zak the Baker bread (you’ll notice that many Miami restaurants serve ‘ZTB’ bread) which were very much necessary to sop up every bit of the tomato-y goodness! For dessert, we were debating between the sticky buns and the Banana Fosters Pancakes – chocolate chips, Appleton rum, vanilla ice cream ($14). We asked our server to help us out and she said she personally preferred the pancakes. I don’t know about those sticky buns but she definitely made a great call. 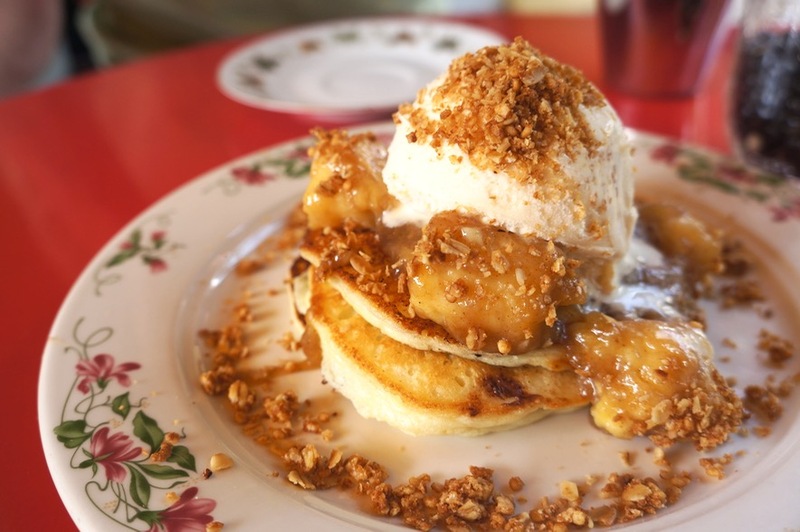 The stack of fluffy pancakes had chocolate chips in between them which melted into this delicious mess with the sweet, flambéed bananas and cold creamy ice cream. These pancakes were the highlight of the meal! Overall, we had a great brunch at 27. 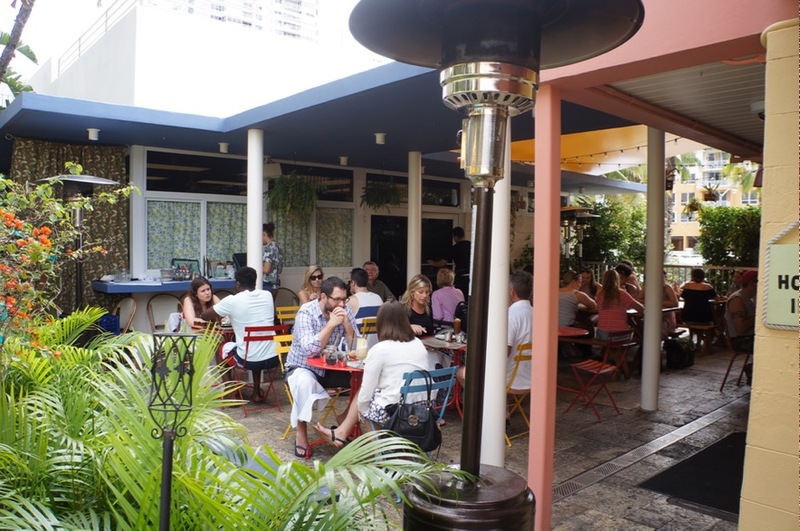 If you’re looking to get away from the stereotypical Miami Beach crowd, The Freehand is definitely the place to be!